So glad to have you back. You were sorely missed. You always brought a smile to my face, Don, but this is truly great news to wake up to. Thanks for coming back. You made my day! Welcome back Don! And nope, you never really left, just stepped away for a moment. See you all in the coming few days. Those habits have been lurking in the shadows, waiting for me to ease up. That has always been my downfall with past (successful) weight loss efforts. I get to the point where I am in a more normal size range, so the extreme pressure is gone, and I relax. I tell myself “I’ve got this, I know how to do it now” and I ease up, go back to a “more controlled” version of bad eating, and eventually it results in a long backslide. But the sooner you arrest the slide and get back to what was working, the better. No need for regrets, Don. Getting back in the saddle after just a month is excellent! So much better than if it had gone on 6 months or a year and you lost half or all of your progress! So very happy to see your update Don. As for getting back on track, you know the drill. Eat those for a few days, and that whale will go back out to sea where it belongs. I did the same thing December and january. Surprisingly I only gained 2 pounds. I’ve cheated on and off since starting but that was the worst. I found out I have severe stomach issues with digestion and I’ve just decided enough is enough. I’m being way stricter this time round, and not looking back, I still stayed on the forums, I still did a lot of Keto days but also a lot of non Keto days! Back at it for the both of us don! You coming back and admitting it to yourself have me the confidence to admit to you I haven’t been fair on me either! We got this buddy! Thank you, Don, for the cautionary tale! I needed to read that. Well, 40 hours after I last posted and so far so good. Cravings, although constantly there telling me it’d be ok to snack or sneak a sweet, are a wee bit easier to recognize for what they are – whispers of the devil. Lately, they tell me to have some peanut butter…or a char siu bao (steamed bbq pork bun). It’s hard not glossing over things and behaving as though everything’s fine. It’s how I cope. But it’s not fine. I’ve spent decades doing that and all that resulted is nearly eating myself to death. Monday I’ll weigh in for the first time in 2 months. Whatever the scale says, I own. Tuesday will be handled the same way regardless of that number. If you’ll excuse me, I have carb-free dinner to prepare…and a dozen eggs to boil. Way to go, Don! … We seem to boil eggs every few days, and always like to have Deviled Eggs on hand. 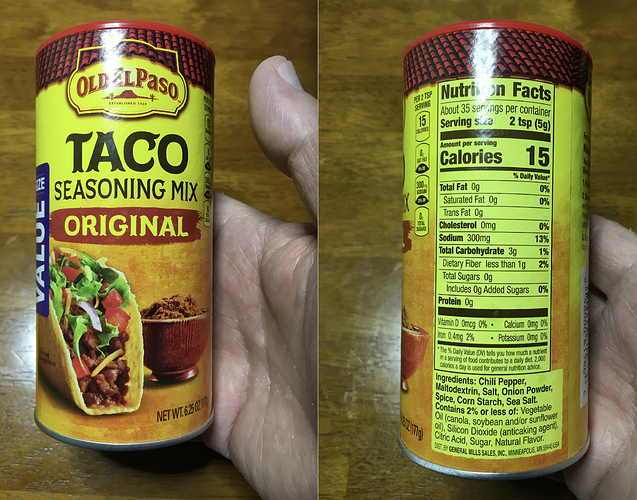 … Tip for ya, if you do like Deviled Eggs… A week ago or so, I was making a batch and had the idea of using Taco Seasoning instead of Paprika! Boy do I love it! Gives it a really nice flavor! This is what I keep on hand to use in meats, meals… and now Deviled Eggs. Not real carby, especially the sprinkles on the eggs. My only issue with that is maltodextrin! I been looking for taco seasoning and a lot have it, i think it’s like 80% what sugar does to your body. Doesn’t affect everyone but it affects me losing weight. Yeah, I know, it’s the one thing I don’t like about it, but looking for something better. But I don’t use very much as it is. … But if you find something, please let me know. Thanks. And Vice versa! I’ve been searching, you can do your own seasoning I’ve seen things online but the upfront cost keeps me from doing it! I’d give it a go, if just a dash or sprinkle! Currently, my devilled eggs use curry powder, salt and white pepper. I’m ready for a new flavor.